When I kicked off blogging for 2014, I totally had a plan. I was going to focus on 1 topic or type of post delivery per month. April was supposed to be a month of How To’s. Well, I clearly have not stuck with the plan! See. What had happened was…. While I had a few “How to” posts in draft form. I wasn’t feeling all of them. I also got a bit distracted with sharing changes to my hair regimen, the NYCFlawlessFace Event and a couple of product reviews. Now, I’m preparing to go to the Atlanta Hair Show/Expo in a couple of weeks. My mind is all over the place! I did however want to share a few quick “How To’s” where styling your hair is concerned and that’s what prompted this here post. The banana clip is a long time favorite hair accessory of mine. I’ve been using it to style my hair since I was in High School (3 years ago 🙂 ). The banana clip can create multiple hairstyles if you’ve got skillz…. 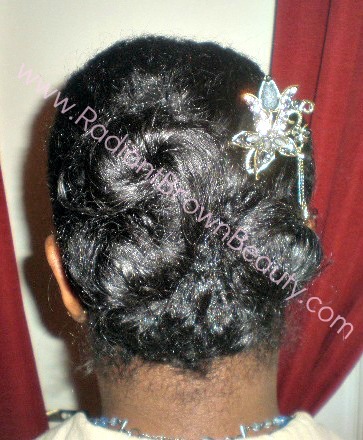 Check out one of my banana clip styles here. When using a banana clip to create a ponytail, leave sections of your hair out at the top and bottom of the banana clip. This will elongate your hair. Score! Banana clip styling is easy peasy but guess what I have been eyeballing? The Puff Cuff! My hair is a bit long and since I don’t get tons of shrinkage to create a puff, I would be using this to create a high ponytail or voluminous bun (stay tuned for future posts). The makers of Puff Cuff are supposed to be at the Atlanta Hair Expo so, yes I will be picking up 2 of these bad boys. Stay tuned for pics and video footage from the Expo.